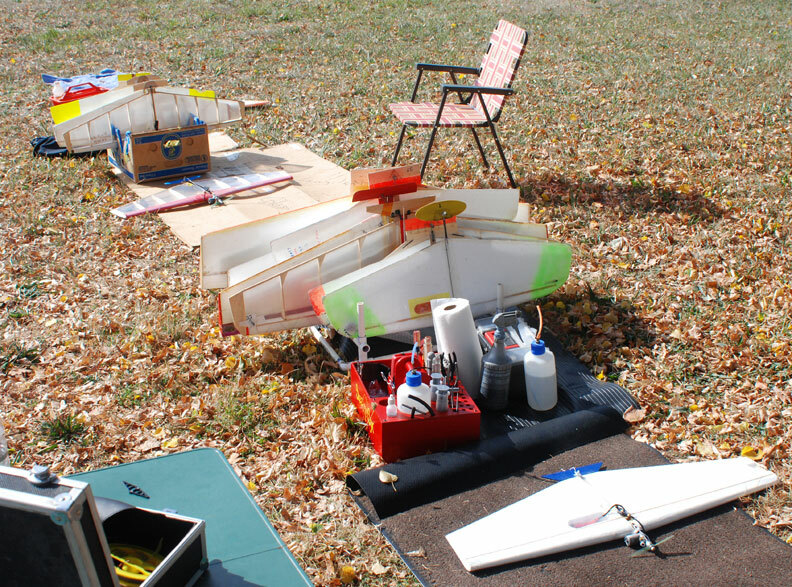 Some of the Expert Precision Aerobatics planes on Sunday at the 29th annual Fall Follies. Flying Lines photo. 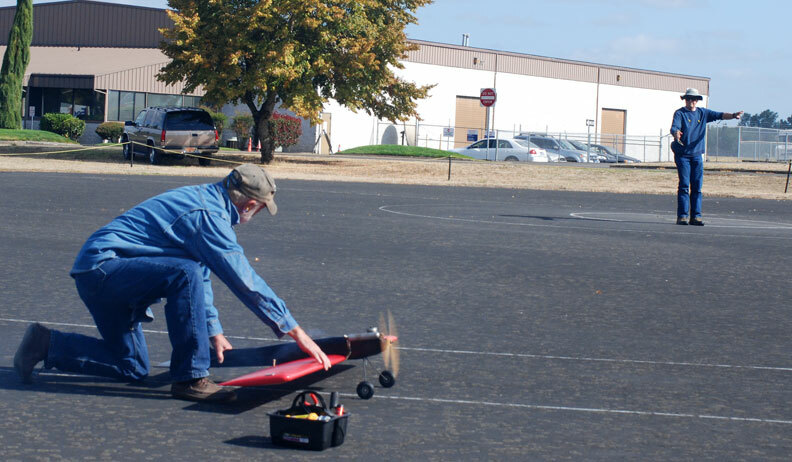 Oct. 3-4, 2015, Bill Riegel Field, Salem, Ore. 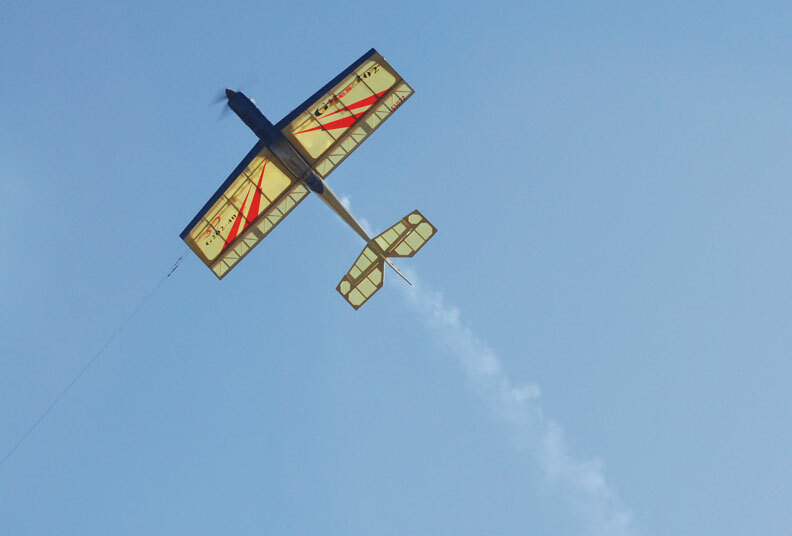 The annual season-ender in Salem neared the end of its third decade with two days of stunt and combat in weather that was sunny, with winds coming up in the afternoons but always within a range that allowed some excellent flying. It was the 29th running of the Fall Follies, sponsored by the Western Oregon Control-Line Flyers. The contest began in Eugene under the sponsorship of the Eugene Prop Spinners, ran for several years in Portland, and then settled in for a very long run at Bill Riegel Model Airpark in Salem. 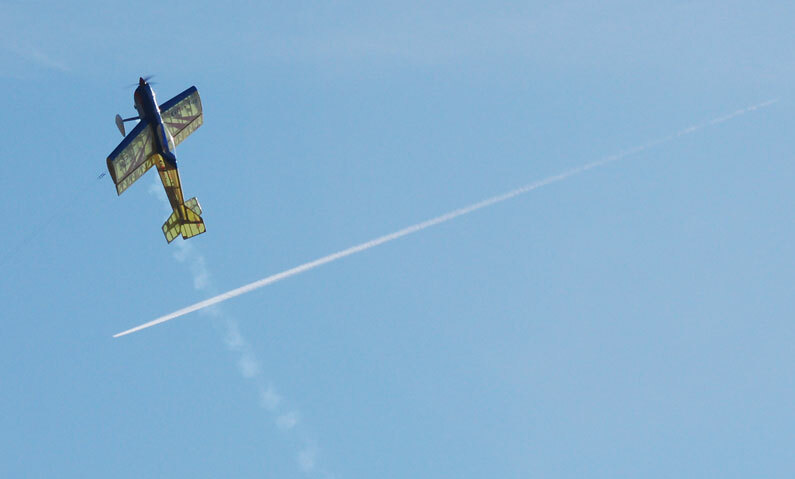 Classic, Old-Time and Profile Stunt were the Saturday events and the four classes of PAMPA Precision Aerobatics were on Sunday. Saturday also hosted the finale of the Chehalis Cup Combat series, with High-Performance 1/2-A Combat and 80mph Combat on the grass field. 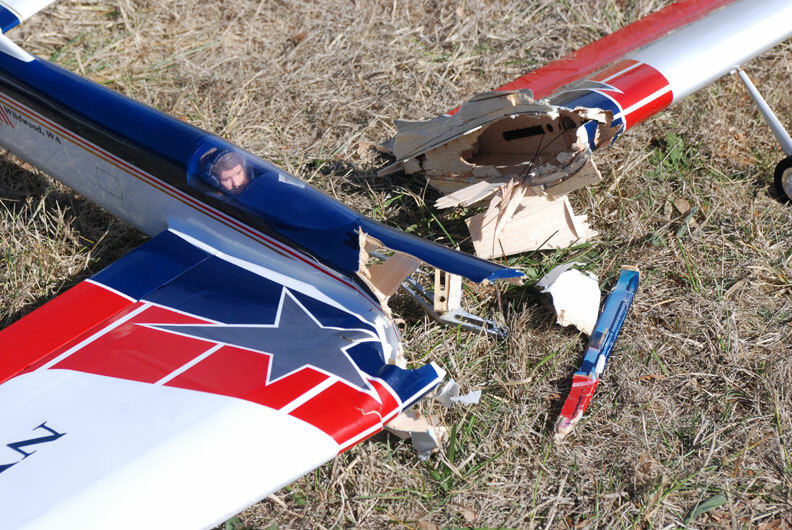 Chris Cox captured the Expert Precision Aerobatics crown, and Dave Royer captured the Advanced trophy. In Saturday events, Scott Riese topped Classic Stunt and Dave Royer won Old-Time. 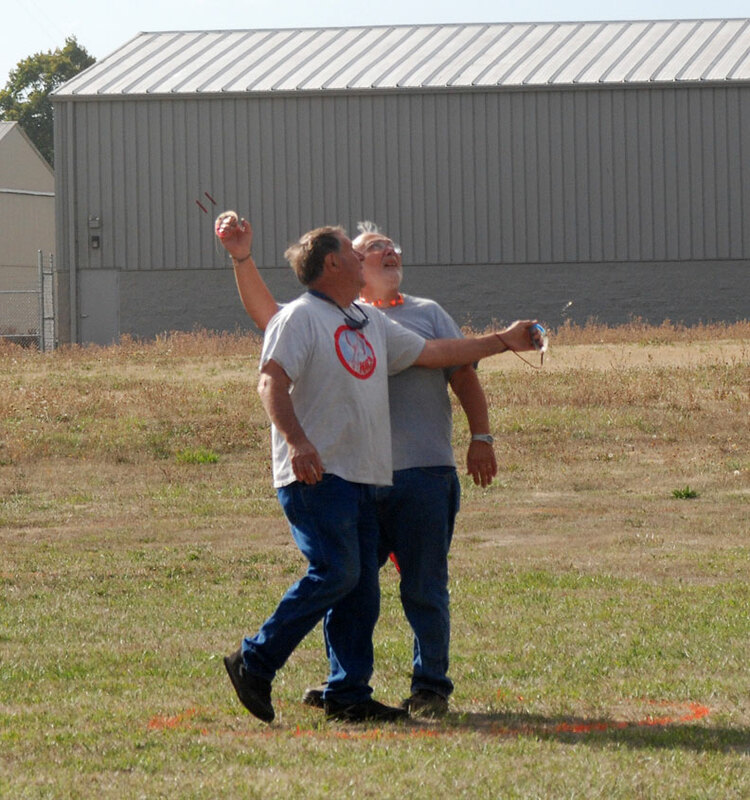 Fred Underwood won Expert Profile Stunt and Mike Hazel captured the Sportsman Profile Stunt class. On the grass, Jeff Rein won both combat events. The Follies is also the place where the annual Vintage Stunt Trophy race is awarded to the top scorer in the Flying Lines Northwest standings in combined Old-Time and Classic Stunt. This year's trophy, sponsored by Flying Lines, was won by Dave Royer, who scored points in both Old-Time and Classic. Previous winners have been Bruce Hunt (2006, 2008, 2009, 2010), Scott Riese (2005), Pat Johnston (2007) and Pete Peterson (2011, 2013), Alan Resinger and John Thompson (2012, tie), and John Thompson (2014). Thanks also to many others who helped out with various chores and details! 5. Gene Pape, Eugene, Ore. 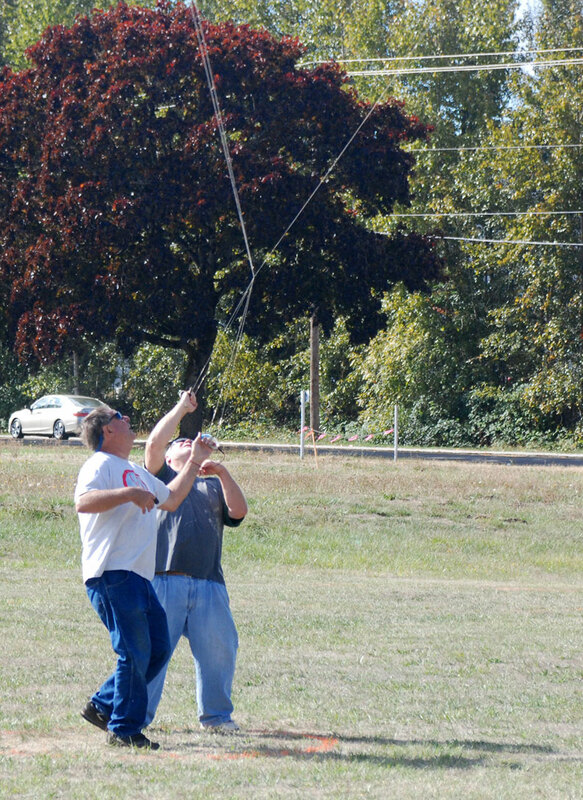 Results of this contest are included in the Northwest Control-Line Competition Standings. 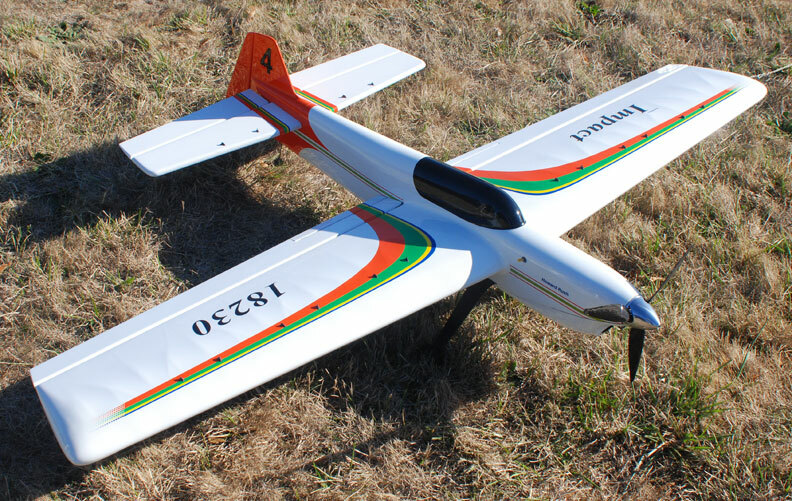 Dave Royer's Magnum Plus puts in a flight in Advanced Precision Aerobatics. Flying Lines photo. 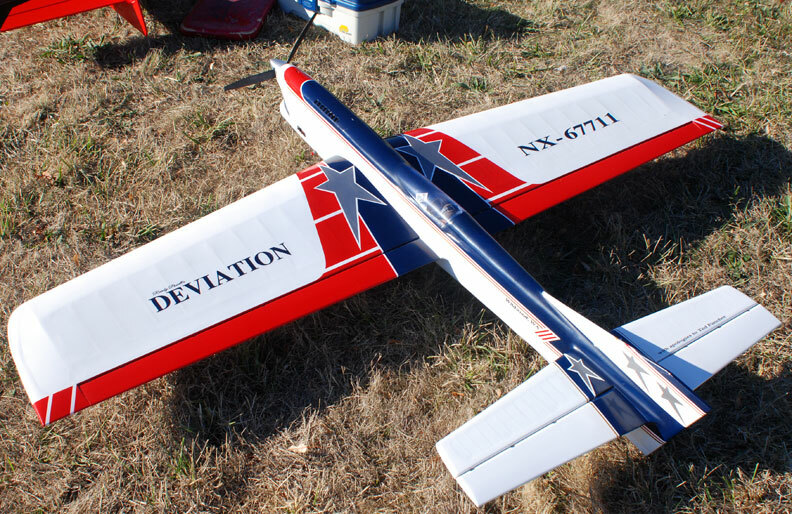 Randy Powell's Deviation was an attention-getting new plane on the Northwest circuit in 2015, but, unfortunately was blown out of a maneuver and met an early end (see photo below). Flying Lines photo. 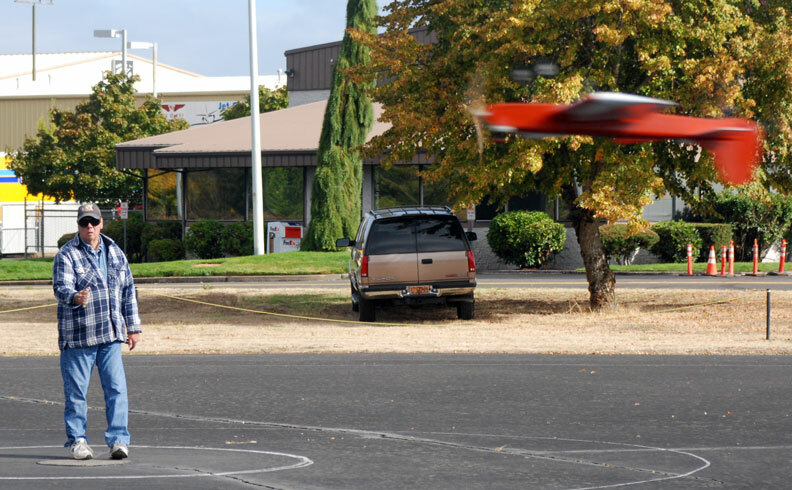 The crash was straight into the Salem asphalt, destroying the plane and most of the electronic components. The motor may have survived. Flying Lines photo. Russell Shaffer signals for takeoff with his Taurus on an Old-Time Stunt flight, as Bill Toschik holds. Flying Lines photo. Precision Aerobatics planes in the pits made for an impressive sight along the nearby roadway. Flying Lines photo. Sun shines through Walter Hicks' Giles 202. Flying Lines photo. 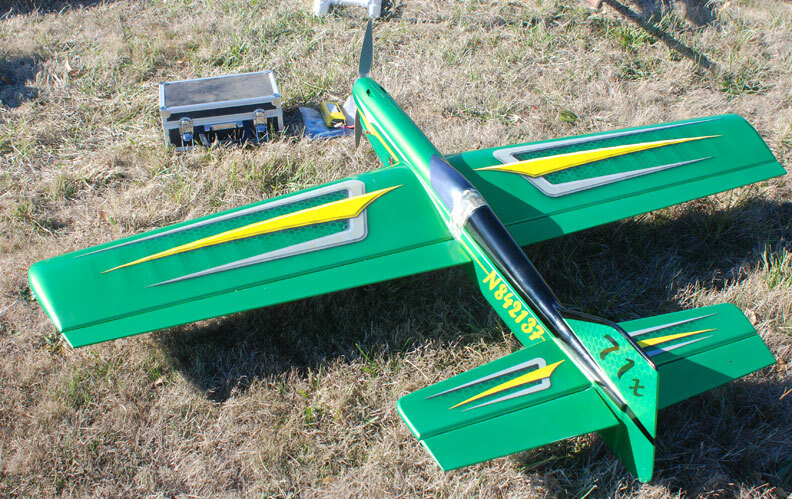 Dave Royer went small in Classic Stunt, flying a Warrior. Flying Lines photo. Mark Scarborough's Impact shows damage from a crash at the Nationals, but still displays Mark's outstanding painting skills. Flying Lines photo. 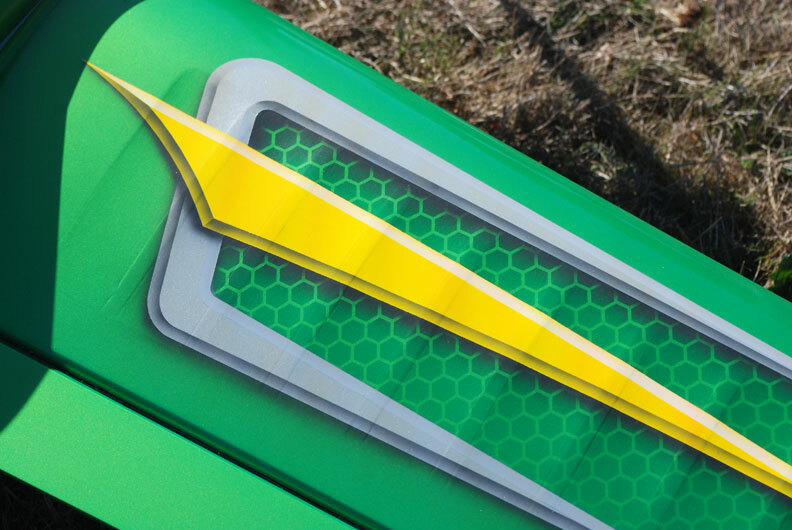 A detail of Scarborough's Impact paint job. Flying Lines photo. Howard Rush's Impact flew in the Follies on the first leg of a long road trip; after the contest he was off to the U.S. world championship team trials in Houston and then the Golden State contest in California. Flying Lines photo. Entry was light but there was lots of good combat action. 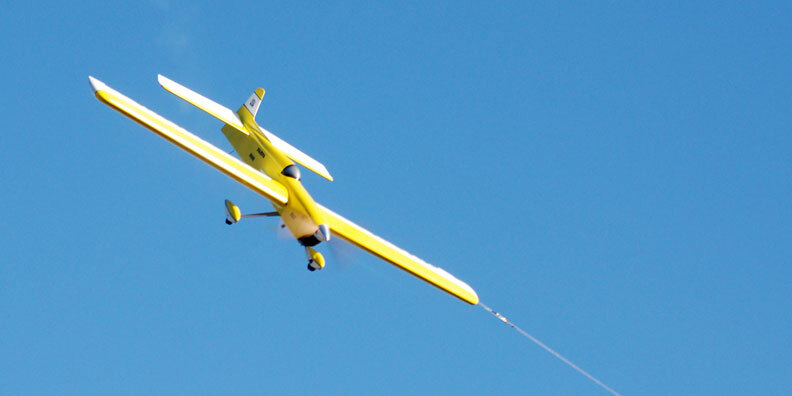 Above, Robert Smith (left) and Mike Hazel fly through a tangle. Flying Lines photo. Robert Smith (left) and Gene Pape jockey for position. Flying Lines photo. 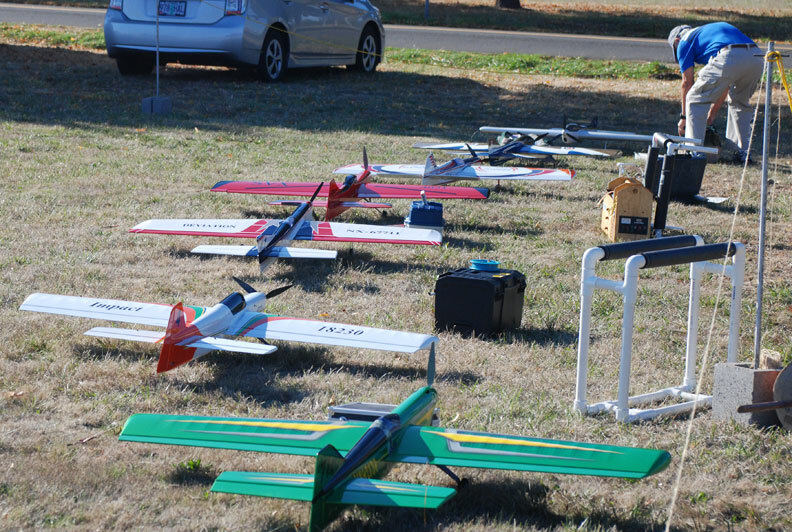 Some of the planes awaiting action in the High-Performance 1/2-A Combat event. Flying Lines photo. 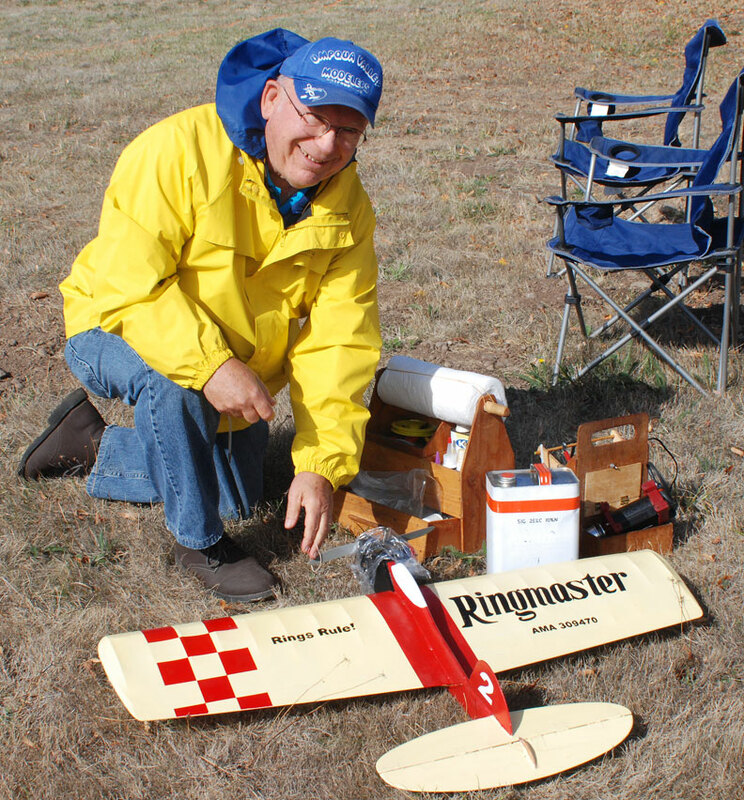 Bob Lewis came up from Roseburg, Ore., to put in some flights for the global Ringmaster Fly-A-Thon. A separate report on the Northwest's Fly-A-Thon participation will be posted elsewhere on Flying Lines. Flying Lines photo. New flier Pat Chewning of Beaverton, Ore., flew this Ringmaster in Old-Time Stunt. Flying Lines photo. 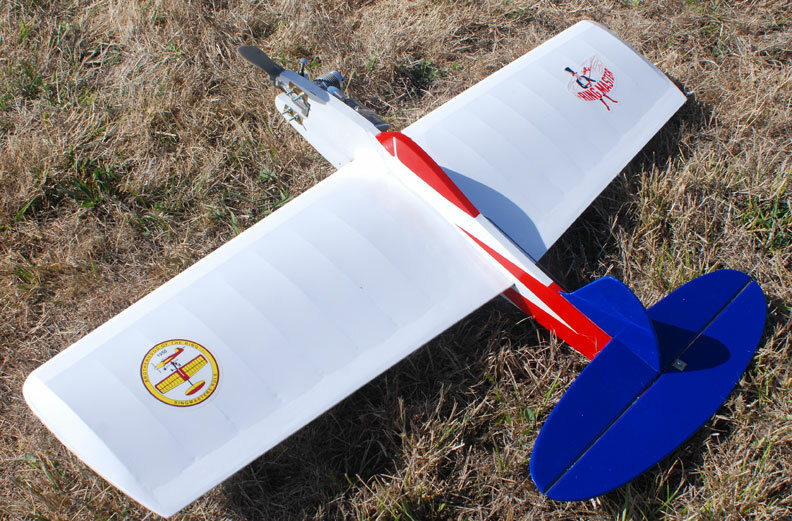 A final look at Walter Hicks' Giles 202 crossing a contrail reminds us of the beauty of control-line model aviation and whets our appetite for more of the same on the contest trail next year! Flying Lines photo.